Enriched with highly bioactive wheatgrass-derived antioxidants. Quality - Our wheatgrass extract is quality controlled by state-of-the-art human genome technology. "I have been using Wheatgrass Recovery Spray in conjunction with Dermaveen moisturising lotion for approximately five months to treat eczema that I have suffered from for decades. I have found this treatment to be more effective than any of the multitudes of ointments, creams and other remedies that I have been prescribed throughout this entire period. Many thanks." Just wanting you to know that the wheatgrass spray we purchased from you has worked! It is amazing. 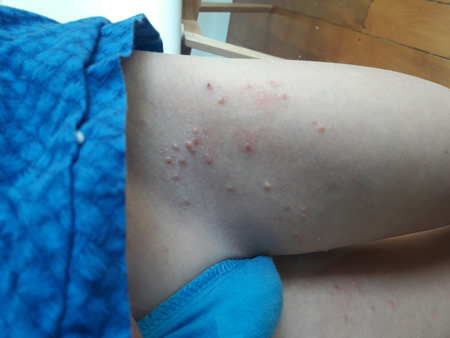 Our 10 year old daughter had what I would describe as fairly serious molluscum contagiosum. We were at our wits end having been told by our GP that there was no medical treatment and that it basically had to run its course – 18 months or so. Some suggestions were to pop the spot and try to squeeze out the white head, I guess a bit like a pimple. This was extremely painful for our daughter and in our opinion it lead to further spreading, no matter how sterile and hygienic we were. We researched and tried many other products, including Epsom salts & ZymaDerm from the USA but the virus just got worse. Look, to anyone reading this, I would encourage you to try the wheatgrass spray, once in the morning & once at night. And stick with it. We actually noticed an improvement within just a few days, but you have to keep up the treatment 2 x per day. I just got the biggest cuddle from my daughter as we had a final look over her body and found the spots are all gone! We beat it, and truly with the help of wheatgrass. I wanted to give you some feedback on the Wheatgrass Recovery Spray I ordered from you to treat my 8year olds molluscum on the 19th of September 2017. Thank you! Thank you! Thank you! This 'magic spray' as we call it cleared his molluscum up in approximately 3 weeks. As you will see by the photos starting from the bottom - the first taken on day one of the spray, 2nd approximately 2 weeks in and the last one taken tonight, although his skin has been good for a couple of weeks now so we have not used the spray. I was having a read of the information you sent through and also on the website today so am trying the spray on my 4 year olds mild eczema to give it a go. I've also just purchased the wheatgrass shots tonight for myself. I'm going to send through these results to my son's doctor to let him know that there is a cure for these dreadful spots and you do not have to put up with them for up to 2 years! With school swimming lessons coming up a big thank you for this amazing product!! I wanted to write to you and tell you how thankful we are for your products. 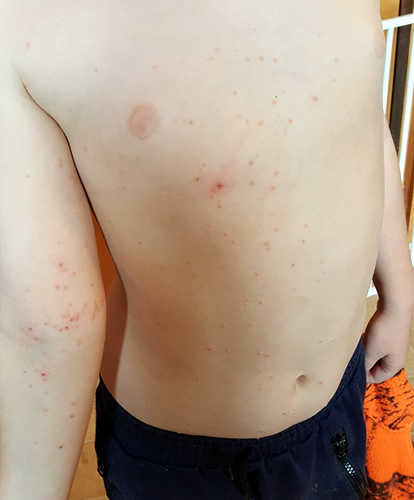 My 8 year old son contracted Molloscum Contagiousm roughly 3-4 months ago, they started out as a small patch and quickly spread all over his chest, stomach, arms and groin area, we tried so many products but every day it seemed like new ones were popping up. I stumbled across your website after searching through Facebook groups for molloscum support and your products were mentioned. I was very skeptical at first I must say, but it seemed like our last resort. We started using the recovery spray on the 22nd November 2017 and now he has one spot left which has scabbed over and is healing. It's an absolute miracle!! We have a toddler and a 9 week old baby that we were so worried were also going to get it but the spray has literally saved us so much stress, the whole family uses it now and I have told as many people as I can about your products, thank you so very much! I have attached a photo of my sons Molloscum above, that was only some of it! This wheatgrass spray is also the best lip balm, blackhead cleanser and aftershave money can buy! This organic spray has many skin-related uses. For more information, explore this website or email us at info@wheatgrass.co.nz. Medical research and extensive clinical experience shows that wheatgrass can often assist when nothing else works. Because it is safe to use at all ages, it is always worth trying. Although improvement may occur after a very short time, it may take a while to get the desired result, so most often, it pays to persevere. This wheatgrass spary has substantial benefits compared with other skin care products because it contains high levels of the Grass Juice Factor. This Factor contains powerful molecules essential for cell growth, tissue renewal and enhancement of the natural recovery process.